To see one very small pumpkin in the center of the stage suddenly become a very large pumpkin in the blink of an eye is an act of magic. But then to see that pumpkin replaced by a very grand golden coach pulled by a team of prancing horses amid a blaze of electrical fireworks is even more magical. But what is Cinderella to do about that house-cleaning schmata she is wearing and what of her hair that is piled high into a rat�s nest? Not to worry when there�s fairy godmother with a flair for haute couture on the premises. Smudge-faced Cinderella confidently runs to the coach. In the next blink of an eye, she is transformed head to toe into a vision of radiant loveliness. Her golden hair is softly cascading to her shoulders and she has just been poured into a stunning white tulip-tiered gown. 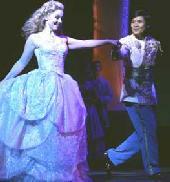 Cinderella is off to the ball to the cheers and applause from the audience as the curtain falls on Act I. If anyone had asked, "Will the real Cinderella please stand up," my guess is that a couple of hundred beautifully coiffed and dressed little girls would have risen from their seats at Sunday night�s opening. And they all looked like they were ready to go to the ball and dance with Prince Charming. Yes, there was a scattering of young lads who had undoubtedly been advised by their parents to be, if not charming, at least well-behaved for the next two hours. Not to worry though -- there is plenty of comedy to keep even the least entranced entertained. No one it seems needed to be coaxed into the mirth of a melodic kingdom that director Gabriel Barre has so cleverly re-considered for his delightful staging of Rodgers & Hammerstein�s Cinderella. All this is not to imply that Cinderella ranks among the greatest in the R & H canon. However, it does have a beautiful score even if it can hardly be said to propel the plot forward or add dimension to any of the characters. Without being campy or remotely childish, this is a version adapted for the stage by Tom Briggs (from the original teleplay by Robert L. Freedman) that has been craftily scripted for contemporary ears. Best of all, in Barre�s hands the implanted comedy reigns supreme. Commanding the stage with an infectious energy in an otherwise small role is Stanley Wayne Mathis, as Lionel, the Prince�s royal steward, proving there are no small roles. Puppetry, a highlight of this production, is deployed with wit and finesse in the likes of Cinderella�s favorite fat cat who becomes a Coachman (James Buller); four hilariously exuberant white mice who become horses (Ron DeStefano, Jason Robinson, Dante Russo, Jason Weston); and a dove (David Tankersley on roller blades) who becomes a footman. Musical theater buffs will notice that "The Sweetest Sounds," the first song you hear in this version is actually lifted from No Strings, another R &H musical. Sweetly as it is sung by Cinderella (Angela Gaylor) and Prince Christopher (Paolo Montalban) soon after they literally bump into each other in the village square, it never aspires to be more than melodic padding. On this neat bit of exposition Cinderella doesn�t realize that she has just met the prince because he's dressed like a commoner. Gaylor, who was most recently seen as Anne in the Tony award-winning revival of La Cage Aux Folles, sings winsomely and affects a refreshingly spunky demeanor as an unusually determined Cinderella. Montalban, who played Prince Charming in the ABC/Disney�s TV version of Cinderella, has what it takes to sweep a girl off her feet as well as a fine tenor voice. "Boys and Girls Like You and Me," which was dropped from Oklahoma, R & H�s first collaboration, serves as a wistful, if also totally irrelevant duet for the otherwise particularly well-matched and unexpectedly compatible King (Larry Keith) and Queen (Joy Franz). Speaking of joy, what a pleasure to have Keith and Franz characterized as an altogether endearing royal couple whose only desire is to see their son have as happy a marriage as theirs. We are as eager to respond to their romantic feelings as we already have to Cinderella and the Prince in the quizzical "Do I Love You Because You�re Beautiful." The plot is so familiar that it defies repeating, so just let it be said that the romantic wishes of Cinderella and Christopher remain timeless and inevitably fulfilled. Time has, however, allowed for color-blind casting, a concept that follows the advice of one of the songs, "It�s Possible." In this optimistic light, the Fairy Godmother (played hip and with plenty of sass by African-American Suzzanne Douglas) proves to Cinderella that anything is indeed possible. And what a terrific idea it is to have an especially beautiful Fairy Godmother envisioned as the protective spirit of Cinderella�s mother who died when she was a child. With a handsome prince who is Asian, one step sister played with laugh-provoking klutziness by African-American Janelle Anne Robinson and the other step sister played with clueless abandon by Caucasian Jen Cody, this Cinderella is opened up in ways that never entered the minds of the Brothers Grimm. And peering through her stunningly garish get-ups Nora Mae Lyng's mean stepmother bristles with every color of the rainbow. Here is one racially-mixed magical kingdom whose only problem with color might be deciding which one of designer Pamela Scofield�s brilliantly hued and whimsically patterned costumes will outdo another. Jennifer Paulson Lee�s choreography provides some breezy and unpretentious divertissements. James Youmans� minimalist yet striking scenic designs include a story-book cutout village, a gold columned ballroom, and Cinderella�s home where the mice are friendlier than family. This family-friendly, wish-fulfilling Cinderella that delivers "A Lovely Night" -- and for some a matinee. Some notes for fact collectors: Originally produced for television in 1957, starring Julie Andrews, in the title role, various stage adaptations of Cinderella began appearing in 1961, but never one on Broadway. The New York City Opera produced it 1993 and most recently in 2004 with Eartha Kitt, as the Fairy Godmother, a role in which she has toured. Although a crude kinescope version of the live 1957 telecast remains, most viewers are familiar with the 1965 version with Leslie Ann Warren and the 1997 version with Brandy. ORCHESTRA -- Keyboards: John O'Neill (Associate Music Director), Ed Goldschneider; Woodwinds: Svjetlana Kabalin, John Schultz, Gary Hamme, Frank Basile, Richard Cohen, Rodney Ruth; Trumpets: David De Rienzo, Jeffery Schweikardt; French Horns: Ann Mendoker, Judy Lee, Lee Ann Newland; Trombone: Walter Schweikardt (Orchestra Contractor); Violins: Edward Raditz (Concert Master), Mary Babiarz, Mark Giannini; Cello: John Furia; Bass: Dennis Masuzzo; Percussion: William Strauss. ©1997, 1998, 1999, 2000, 2001, 2002, 2003, 2004, 2005 Elyse Sommer.